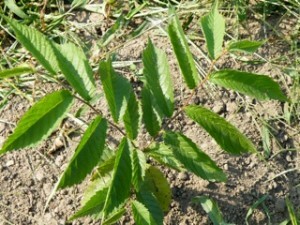 Notes: the leaves of this slippery elm seedling are very similar to the other elm varieties growing here. I’ve never seen a mature one so this is an ongoing study. Ruth’s comments: Slippery Elm bark is a favorite ancient all purpose gift to humans that is becoming well known in our time. The inner reddish bark is dried, and finely ground into a powder. The slippery elm powder I get is a light tan color which gets a bit darker with the honey. When mixed with hot milk the brew thickens and reminds me of hot chocolate in consistency. It becomes thicker by the minute however and a spoon will be helpful to get the last from the cup. At that point it is like thin oatmeal, but not lumpy. It feels good going down and has a pleasant taste, like ground nuts. Below is the recipe I use and more about working with it. 1 cup (8fl oz, or 250ml) of organic milk, whole or as desired. Milk substitutes can be used such as almond or rice milk or just plain filtered water can be used. Heat the milk in a saucepan to hot but not boiling. Meanwhile mix thoroughly the slippery elm powder, honey and cinnamon (if you are using it) in a small bowl. It will get very thick. When the milk is hot remove the saucepan from the heat. Add 2 or 3 tablespoons of the hot milk (30 to 45ml) to the mixture stirring to thin it evenly. Then pour it into the hot milk in the saucepan and stir until thoroughly blended. Pour into a heavy mug so it stays hot longer and sip, slowly consuming the whole amount in about 10 minutes. It will continue to thicken. If the stomach feels irritable hold the hot mug close to the body, placing it over the clothing, so that the warmth penetrates. Or use a warm pack of heated dry rice or a hot towel placed over the abdomen. Substitutions. Unpasteurized honey is preferred because the enzymes and antibiotic action are largely intact. Sugar should not be used. A natural organic syrup such as pure maple syrup can be substituted but doesn’t have the same action as the honey. This gruel is nourishing and comforting and suitable for all ages. It can be given to animals as well as humans and is especially useful for small children, the elderly and frail, or those who are not eating well. It is also very comforting in times of stress, or insomnia. When recovering from illness this gruel can be given as a meal substitute until the individual can tolerate solid food. It has been used as a survival food by many ancient people in which case it is mixed with hot water instead of the milk, with or without honey. A packet of this should be in every home for all season use, as well as emergency food. In my home this is more soothing than hot chocolate, and more beneficial. I enjoy it in winter especially. For dry skin make up some of the gruel with plain hot water, letting it cool, and then smearing on face and hands for a wonderful treat. Store the slippery elm powder in a container that keeps out moisture and light, in a cool place. It is preferable to store it in the original foil packet it comes in if bought in bulk. The shelf life, once the sealed packet is opened, is up to three years if kept cool, dark and dry. Slippery elm was also used extensively as a medicine. The Iroquois scraped the bark of the tree and used it in combination with other plants to treat infected and swollen glands. The inner bark was made into an eye wash for sore eyes. The Menomini used the inner bark in a tea and it was taken as a physic. The inner bark was used by the Menomini and the Meskwaki in a poultice to heal sores on the body. Meskwaki women drank a tea of the bark to make childbirth easier. The tree also was used by the Ojibwe to treat sore throats. The fresh inner bark was boiled and the Dakota, Omaha-Ponca, and other tribes drank the resulting decoction as a laxative. The indigenous people generously taught some of these uses to early non-Indian settlers.